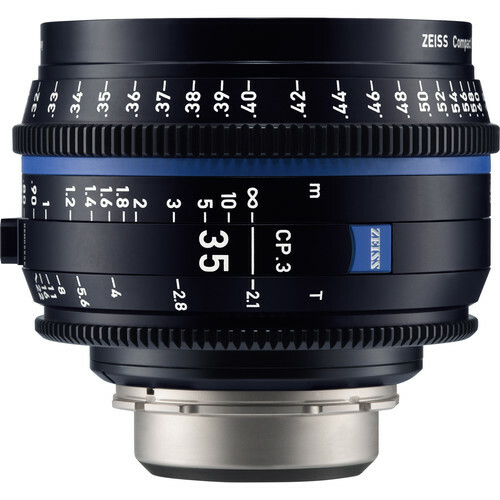 Building on the success of the well-regarded CP.2 lenses, ZEISS's CP.3 Compact Prime Lenses offer the same full-frame sensor coverage and classic ZEISS look in an updated form factor and with improved mechanics and lens coatings. This 35mm Compact Prime lens is derived from the same classic optical formula as the preceding CP.2 variant and shares the same physical length as the 15, 18, 21, 25, 28, 50, and 85mm CP.3 lenses while maintaining identical focus and iris gear positioning with the entire set of CP.3 lenses, relative to the mount. All CP.3 lenses also share the same 95mm front diameter. Similar physical attributes across the lens line makes fitting lens accessories such as matte boxes, follow focuses, lens supports, and lens control motors easier and less time consuming. Another feature handed down from the preceding CP.2 lenses is the interchangeable mounts. This lens comes with a Canon EF mount installed. Though, if you wish to fit your CP.3 lens to a different camera, the lens mount can be swapped by the user for a separately available mount of a different kind. If you like the bokeh in your images to be round, even after stopping down, you will be pleased to know that the 14-bladed iris, made famous by the CP.2 lenses, has been retained. Note: While the CP.3 lenses are designed for a degree of user-serviceability regarding the mount, for ideal performance and calibration, B&H recommends that mount swaps and other lens adjustments be done by a trained lens technician at a service center. ZEISS lenses are known for their clean and crisp image rendering. The CP.3 series of lenses is no different. This CP.3 lens will accurately color-match to other ZEISS cinema lenses inside and out of the CP.3 range. The CP.3 lenses feature improved lens coatings and anti-reflection masking over the CP.2 range for increased contrast and reduced flare, important for capturing content with the intent of an HDR-format release. For enhanced ergonomics over the previous-generation CP.2 lenses, the CP.3 lens barrel has been reshaped to be more similar to the renowned ZEISS Ultra Prime lenses. This new shape is easier to handle, and takes up less physical space than the original Compact Prime design. An even weight distribution ensures that these lenses will be at home handheld, locked down on a tripod, or flown on a Steadicam or motorized gimbal. Box Dimensions (LxWxH) 10.0 x 9.3 x 9.1"